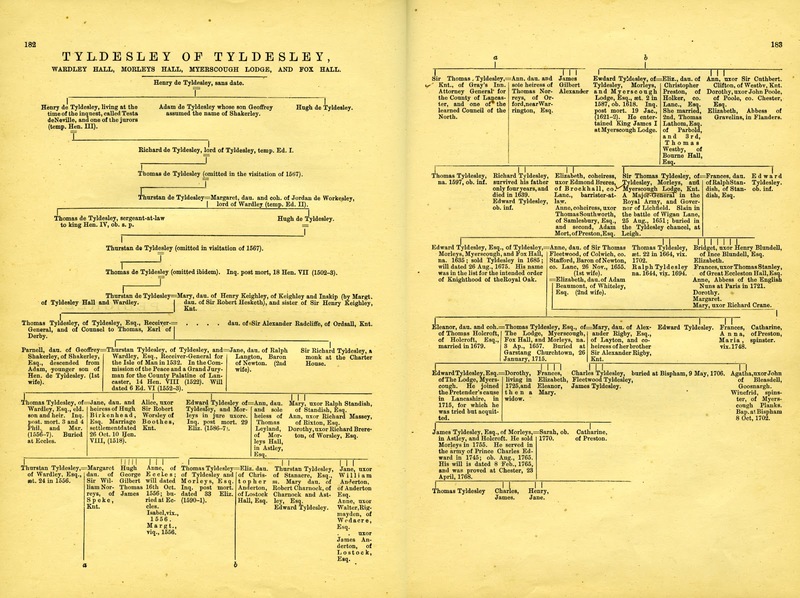 The single most useful published Tyldesley pedigree is that given by Joseph Gillow and Anthony Hewitson in the 1873 edition of the Tyldesley Diary 1712-1714. It is, however, incomplete and it contains a number of minor errors and one major howler. Gillow and Hewitson suggest that the second wife of Thomas Tyldesley 1657-1714 was Mary Rigby. In fact his second wife was Agatha Winckley. Mary Rigby appears to have been the wife of his uncle, also called Thomas Tyldesley. Tyldesley, Thomas jacobite, born April 3, 1657, son Edward Tyldesley, of Tyldesley, Morleys, Myerscough Lodge, and Fox Hall, co. Lane., Esq., and grandson of Sir Thomas Tyldesley, the famous royalist general, was educated at St. Omer's. In 1679 he married Eleanor, dau. and coh. of Thomas Holcroft, of Holcroft Hall, co. Lanc., Esq., and after her death in 1693, married, secondly, Agatha, dau. of Wm, Winckley, of Banister Hall, co. Lane., Esq. Upon the revolution of 1688 he took part in a movement in support of James II. at Chester, and throughout his life, whilst leading the life of a country squire, was an ardent Jacobite. He died at Myerscough Lodge, just before the Chevalier's attempt to recover the throne, in which his son Edward took part, Jan. 26, 1715, aged 57. Gillow, Tyldesley Diary, and Lanc. Recusants, MS.
1. "The Tyldesley Diary. 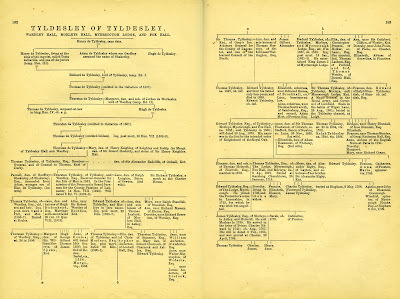 Personal Records of ThomasTyldesley (grandson of Sir Thomas Tyldesley the Royalist), during the years 1712-13-14 ; with Introduction, Notes, and Index, by Joseph Gillow and Anthony Hewitson. Illustrated." Preston, 1873, imp.8vo, pp. 192.